Clayton King is still expediting, but now he's racking up the miles in a brand new truck. We first met Clayton in an Expediters Online Driver Profile a little over two years ago. At the time, he was plying his trade in a 2000 Freightliner FL70 with an Alumi-Bunk 76" sleeper and 240,000 miles on the odometer. Well, Clayton has two more years in the expediting business under his belt and he figured it was time to replace the old truck. His new ride is a 2003 Freightliner FL106 with a 50 series Detroit engine running through an Allison automatic transmission. The new truck also features an Alumi-Bunk 96" sleeper with pull-out couch, sink, fridge, microwave, TV/VCR and XM Satellite radio. A 22-foot cargo box and tag axle with chrome wheels and chrome bumper complete this expediting truck. 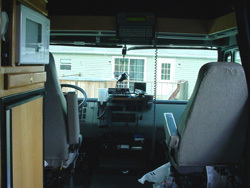 Oh, and add a wheelchair lift and hand controls including a keypad for the automatic transmission to that list of truck modifications. You see, Clayton was injured in an accident around ten years ago - an accident which left the now 32-year old man paralyzed from the chest down. 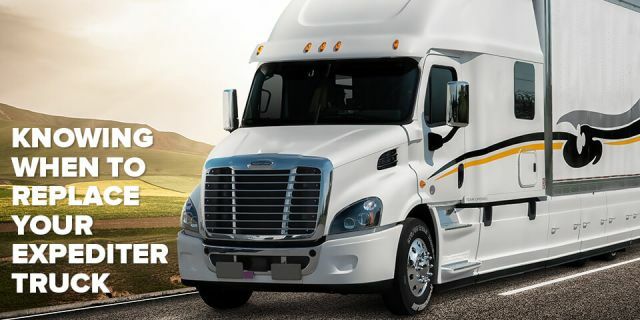 Clayton, who comes from a trucking family, had always wanted to join the ranks of professional drivers and with the help of his mother and others, he realized that dream a little over four years ago. It's been a steep learning curve and Clayton has overcome obstacles that very few in this business ever have to face. 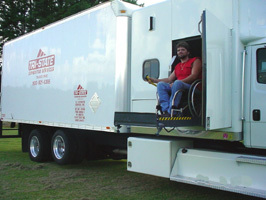 Clayton operates his truck as part of a company called Freedom Express from Linden, TN. Freedom Express is a five-year old company owned by his mother, Patricia Smythia, who is also a driver as well. 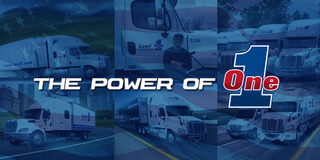 Freedom Express fields a fleet of 12 trucks leased to both Panther II Transportation and Tri-State Expedited Service, Inc. This past December, Clayton was involved in accident that occurred only 30 miles from his home. While heading home for Christmas, he made contact with a woman who had pulled out in front of him from a side road. "I was able to slow it down from 55 mph to about 30 mph before I hit her broadside," says Clayton. "No one was hurt too badly, but both vehicles needed repair - hers more than mine, naturally." "My co-driver and business partner, Jerry Medlin and I have been running pretty well lately," says Clayton. "We signed the truck on with Tri-State back in March and we've been pleased with the loads we've been getting." Greg Hermes, Tri-State Expedited Service, Inc. Recruiter says, "We're happy to have him back! Clayton began his expediting career here at Tri-State and it's great to work with him again. He's hardworking, friendly and has a great disposition." 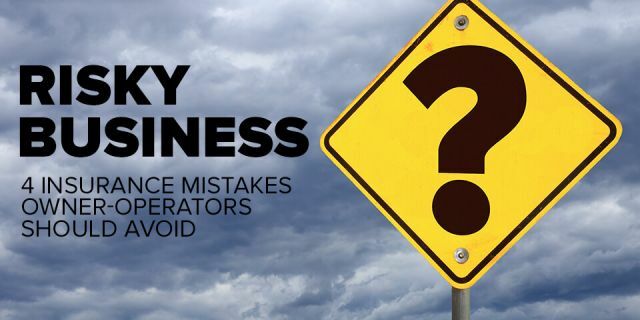 "I remember when Clayton first called Tri-State about getting into expediting. We told him that if he could meet all the qualifications (DOT physical, CDL, etc. 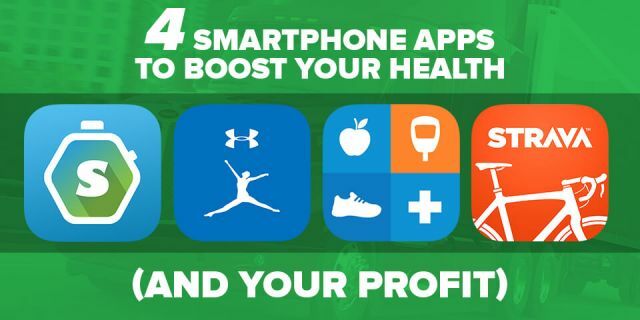 ), you're in. Clayton and the folks at Freedom Express made a real commitment to this business, because they had to take delivery of the specially-equipped truck before he had passed his tests. They really went out on a limb, and it worked out for him." "Pat and Sue at Freedom Express run a good operation - they have very little turnover - so they must be doing something right!" Melanie Pierce has been with Alumi-Bunk for five years, working at the main facility in Dundalk, Ontario. She says that, among her other duties, she acts as a customer service representative, ensuring that the customer receives the equipment he orders. Melanie also takes an active part in the design of the sleeper interiors. "On this sleeper," she begins, "the design structure was similar to the 78" sleeper Clayton had on his first truck. This new double-bunk sleeper is all aluminum as opposed to half aluminum, half fiberglass." 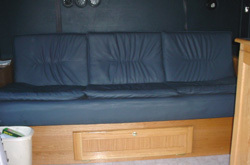 "The pull-out couch features mounting brackets encased in oak wood. There is also a storage box for blankets and pillows, so when it's set-up as a couch, it's a very neat look." "Because of the larger size of this new sleeper, it was possible to make the wheelchair lift door smaller and that resulted in extra space for upper cabinets on the door side of the unit," says Melanie. Clayton says, "I was down for about a month while the truck was being built. I made a trip up to the Alumi-Bunk plant in Dundalk to drop the truck off. It was there that they pulled the Ricoh chair lift from the old truck to install it in the new one." "Construction and installation of the sleeper took some time," continues Melanie, "because of the special nature of the wheelchair lift's design. 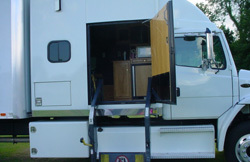 The complete lift assembly is mounted internally in the sleeper and only requires fourteen inches of space inside the unit." 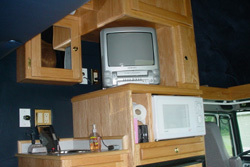 Clayton says, "Alumi-Bunk was very receptive to my suggestions about some changes to the sleeper. I decided to go with vinyl on the walls and a linoleum floor because of fuel that gets on the wheels of my chair. I found that the fuel soaks into carpeting and the hard surfaces are much easier to keep clean." This special expediter says that he is able to make it back to the house every few weeks to see his teenage daugters who live with his mother. Clayton tells us that expediting still presents obstacles for the physically-challenged, but with the help of co-driver Jerry and his mother, Pat - who also teams with Clayton on occasion - those obstacles are still manageable. One problem area in particular for Clayton is in fueling the truck. If he is running solo, it can be an involved process to maneuver the truck far enough away from the fuel island to allow him to use his chair lift, yet close enough for the hose to reach the tanks. Clayton handles that inconvenience and many others that he faces on a daily basis with aplomb and a positive attitude. Clayton King remains as an example of dedication and persistence. 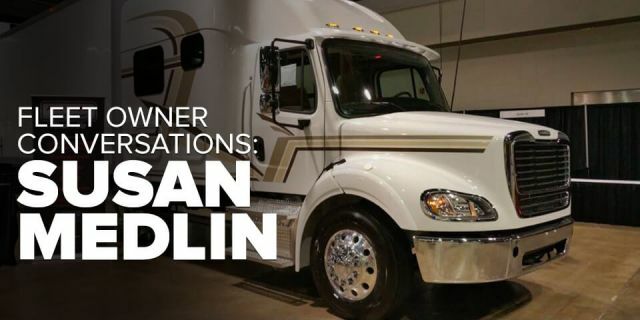 He had a goal - to drive a truck professionally - and he found a way to achieve it.